Mr. Charles R. Hughes, who died at his residence in Galveston Thursday morning, Aug. 5, was a native of Ireland, but emigrated to America at an early period in his life and became a resident of Canada. He came to Texas some thirty years ago, with his family of children, his first wife being dead. He was a fine accountant, and was a member of the leading house of Wm. 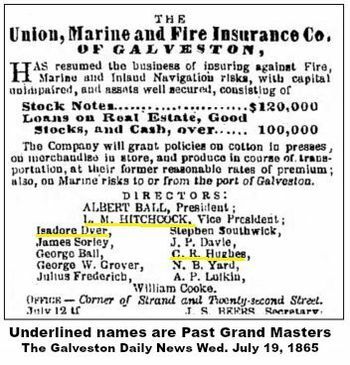 Hendley & Co., in Galveston, and afterwards a member of the commercial firm of Mather, Hughes & Saunders. His second wife was Mrs. Brannum, widow of a commander in the Texas navy, whose vessel and all on board were lost in the gulf during the days of the Republic of Texas. Mr. Hughes was identified with many measures of public interest during his long residence in Galveston, and was Secretary of the Gulf, Colorado and Santa Fe Railway Company, from the date of its active organization to the time of his death. He was a prominent and active Odd Fellow, devoted to the charities and amenities of the order. He was M. W. G. Patriarch of the R. W. Grand Encampment of Texas in 1853, and was subsequently for several successive terms R. W. Grand Treasurer. 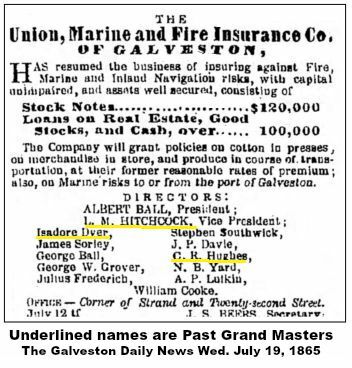 He was also Grand Master of the Texas Grand Lodge in 1862, after having been twice Deputy Grand Master, and succesively for eight years Grand Treasurer. He was also a leading member of the Episcopal Church, where he had the position of Senior Warden of the vestry. Mr. Hughes was a man of quiet and unostentatious bearing, but was genial and attractive among friends who many and warm, and in the domestic circle was the venerated center of respect, love and clustering affections. 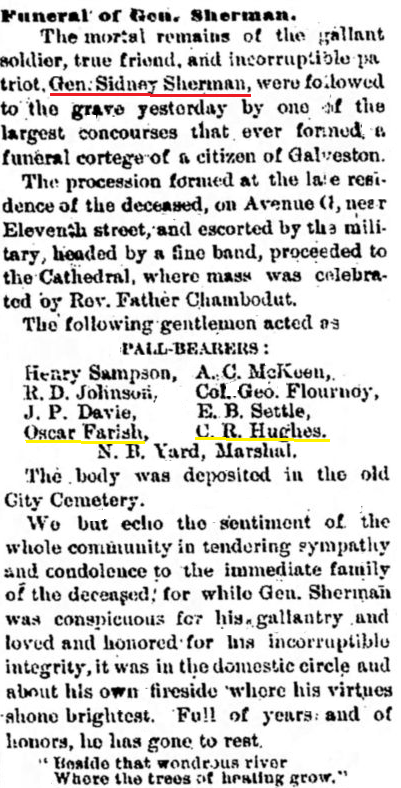 It will be remembered that he marched with the Odd Fellows in the funeral procession of Mr. Richardson as a pall-bearer, which caused him a good deal of fatigue, and when he returned found Mr. Shelton, a relative of his family, dying. The fatigue and shock broke him down, and on Tuesday morning he was believed to be dying. He rallied somewhat in the evening, and by Wednesday morning the more alarming symptoms had subsided, and some hope of his restoration was indulged. He afterwards grew worse, and ceased to breathe at six o'clock on Thursday morning, before the arrival of his family, who had been telegraphed in Virginia when the alarming symptoms appeared. They have the sympathies of a large circle of friends. The deceased was of a kind-hearted and sympathetic temperatment, and to him and his family many were indebted for soothing ministrations that rob sickness and suffering of much of their terrors. In times of epidemics the Hughes dwelling often became a temporary hospital, and its inmates nurses and watchers with the sick, many of whom cherish grateful recollections of their kind offices, and will deeply lament the present sorrowful event. C. R. Hughes was actively identified with many measures of public importance during his long residence in Galveston, Texas. He became Secretary of the Gulf, Colorado & Santa Fe Railway CO. from the date of its active organization, and remained as such until his death in 1875. 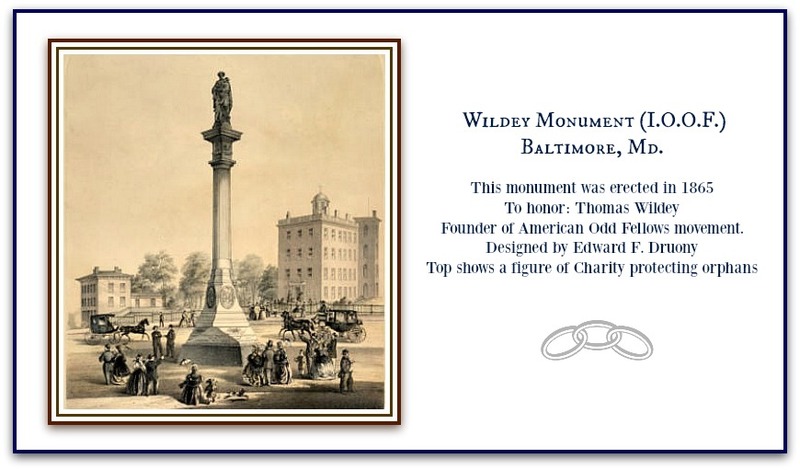 Mr. Hughes was a prominent and active Odd Fellow who fulfilled numerous duties, and was conscientiously devoted to the charities and amenities of this noble order.